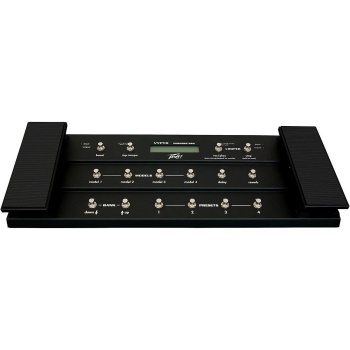 Take total command of your Peavey Vypyr Pro amplifier's functions, onstage, in the studio, or at home, with a Peavey Sanpera Pro foot controller. The Sanpera Pro includes 16 heavy-duty footswitches, two expression-style pedals, and an easy-to-read display for comprehensive foot control of your Vypyr amp. It gives you tap tempo to create tempo-synced effects, and enables the use of the onboard looper on the Vypyr amp. Its cast metal housing ensures dependable, road-worthy performance, too. Discover everything your Vypyr has to offer with this Peavey Sanpera Pro foot controller!